In Vyšší Brod we offer camping in a private garden next to the Pension Inge 2. 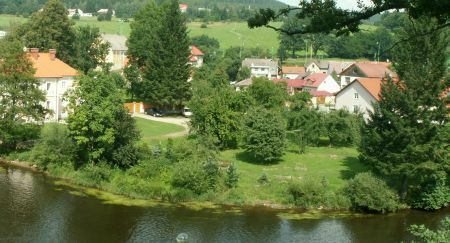 The large garden is situated on the bank of the Vltava river, about 150 m from Ingetour boat rentals in the Campsite Pod Hrází. Camping in the garden is recommended to families with small children or groups that prefer quiet environment or privacy. The area is surrounded by a fence and accessible to the guests only. With regard to the location in a residential quarter and nearby pension Inge 2 it is necessary to keep quiet after 10:00 p.m.!